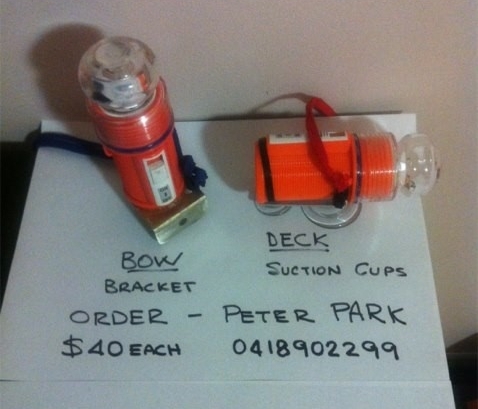 Peter Park at Toowong has modified off the shelf Sealights to be adapted to fit on a club rowing boat. It comes with a sucker for the stern facing light, and a bow number plate for insertion in the bow number holder. 4 x AA batteries last well, and the unit has a light sensor so it turns off at sunrise automatically. Currently $40.00 for a full kit. Whenever you operate a vessel on the water from sunset to sunrise or when there is poor visibility, whether at anchor or underway, you must secure that it exhibits the correct lights as requested by local authorities and/or international law. Following these rules is not just a means to operate legally but to make sure your own, as well as others safety, is maintained correctly. Whether you are paddling, rowing, sailing or motoring, on a lake, river or offshore you need to secure that you can be seen. 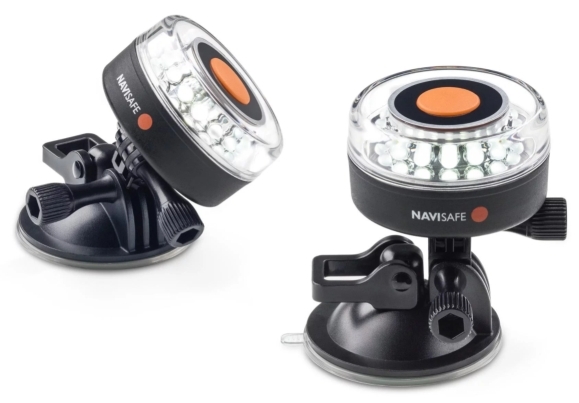 Navisafe makes this more than easy for you. The link on the image to the right takes you to a local supplier, who charges $199.90 for 2 lights with the Go Pro sucker attachment. No question, boats need a navigation light for low dark mornings and evenings. 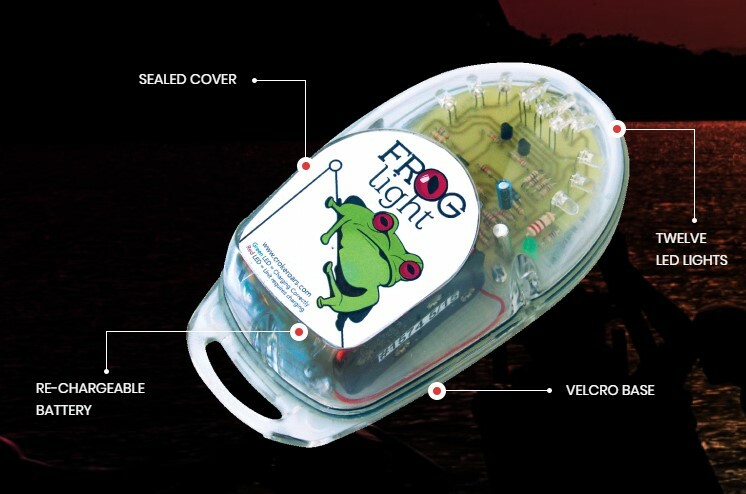 The Frog Light has been developed especially as a boat navigation light, offering effortless operation, reliability and durability. When the boat comes off the rack and goes onto the water, the lights will automatically switch on and off when needed! The automatic light detects when the boat is turned over or when there is enough daylight to switch off. No remembering switches or pulling apart for maintenance. Just leave on the boat and recharge when the light indicates.